“What are they saying, Jason?” Sara sat on the back steps of the townhouse deck with her three-year-old grandson. He had quite an imagination. The clatter of the crows was so loud she could hardly hear herself think. The noise irritated her, plucked at her nerves. The birds always congregated in the woods behind her home, but nothing like today. They must be migrating. Did crows migrate? Hundreds, maybe thousands of blue-black wings filled the sky, landing in the woods behind the condo complex. Some were huge, maybe ravens. Did ravens and crows hang out together? The way they were gathering was creepy. It made Sara nervous. Her grandson was talking. “I’m sorry, Jason. Nana wasn’t paying attention. What did you say?” The din of the birds was distracting. “They say, ‘come…come…come with me.’” Jason cocked his head. “Can’t you hear, Nana?” He almost looked like a bird. Thin and pale with dark hair and eyes. When he ran, his little arms flapped in the breeze like a baby bird trying to fly. “We go to party, Nana? My birthday. Jason’s three.” A Halloween baby. Tonight was Halloween. “You’re having a party tonight, baby. Everyone will be here. Mommy and Daddy, all your cousins and friends. Everyone’s going to dress up.” Too bad Jason’s birthday landed on Halloween, hard to distinguish between birthday and holiday. “Let’s go in and get ready.” She stood and took his hand to lift him to his feet. “No, Nana. Birds talking to me.” Jason pulled away. He still had some of that terrible-twos attitude and disagreed with everything. “I wanna stay here.” He plunked himself down on the steps and folded his arms tightly against his chest. “You can stay but don’t leave the deck.” Sara didn’t want to argue; she could see him from the kitchen. As she stirred batter for a cake, Sara watched Jason through the window. He turned and looked at her every few minutes, grinned, waved, then returned to concentrating on the birds. She mixed orange and chocolate frostings, washed dishes, put things away…stopping now and then to peek out at her grandson. Finished with her chores, she opened the door to call him. No Jason. Her heart squeezed and her breath stopped. He couldn’t have wandered far. He’d waved at her only minutes ago. Sara scanned the yard and spotted him sitting in the grass by the trees. The air escaped her lungs like an explosion. He was surrounded by birds. So many birds. What were they doing? Silence, no cawing. Sara panicked and stumbled down the steps. As she ran toward Jason, the crows flew, blackening the sky, the whir of wings so strong her clothes swirled around her. Sara’s heart drummed against her ribs, banged in her ears. She thought it would burst by the time she reached Jason and grabbed him. 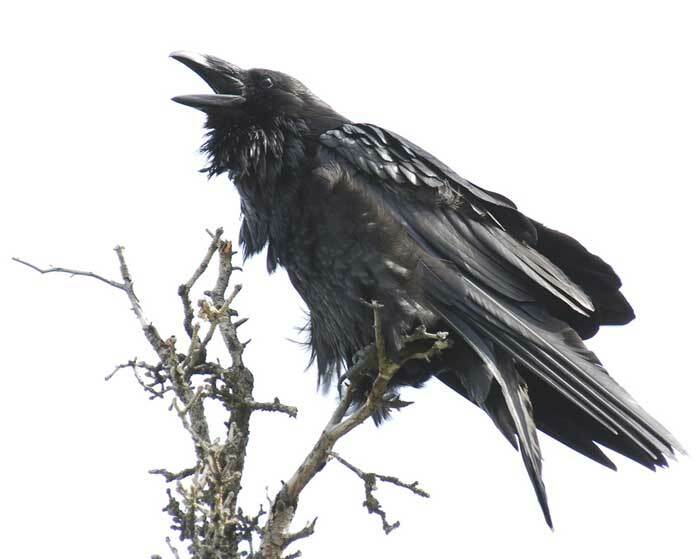 “Nana, you scared them.” He started to wail, and the crows wailed with him, screeching all around…in the trees, from the roof…as Sara hurried to her house and slammed the door behind her. Jason yowled in her arms. By the time they’d dressed for the party and the guests had arrived, Jason was happy and playing again. He joined the children and a few adults trick-or-treating. Sara felt silly about her reaction to the birds that afternoon. She told no one. The birds must have landed in the grass, and Jason couldn’t resist. But why didn’t they fly away? They only flew when she ran from the house. The doors were open to the warm night air. “Do you hear those crows?” She could hear them cawing, calling out, Jason…Jason…. What an imagination she had, worse than her grandson’s. But weren’t crows usually quiet at night? Looking out, she could see their black bodies flying, covering the sky, blocking out the moon. She shivered and returned to the warmth of the party. Where were the trick-or-treaters? She wished with all her heart they would return with their candy. Noise at the front door drew her attention and the children piled in, grinning and chattering and comparing their take. Jason sailed by her and out the back door before she could stop him. “Jason!” she screamed. “Don’t go out there!” Everyone stared as she sprinted after her grandson. No Jason on the deck or in the yard. She flipped on the outside lights. Nothing. No child, no birds, no noise. The emptiness chilled her. “Jason!” Sara was frantic. Adults carrying flashlights poured into the yard, searching, crashing into the woods. Sobbing, Sara sank into the grass. “The crows took him,” she said over and over. Someone called 911. When the police came to organize the search, they sent Sara to the hospital in an ambulance. A mild stroke, the doctors said. When she told people about the crows, they thought she was hallucinating, her mind scrambled. Sara knew better. She returned home two weeks later, Jason still missing. The official opinion: kidnapping. Easy to take a child with crowds of children in the streets. No one would notice a stranger enticing a child into a car and speeding away. Sara brooded around her house, seeing Jason in every corner. He would never visit her again. Her heart was broken. She pictured him sitting in the grass surrounded by crows, talking to them. No Jason, no crows. Silence. A year passed, and the crows never returned. Not even the few who usually hung out in the woods during the summer. Halloween came, Jason’s birthday. No party this year. Sara had no treats for the youngsters ringing her bell. She turned off the front light and slipped out the door to her deck. She stared across the lawn to the spot she remembered seeing Jason. Why was she torturing herself? She should move from this place. But something kept her here, some illogical hope that he would return. The night carried the voices of children as they skipped from house to house. Sara sat on the steps. Tears rolled down her cheeks. And then they came. Thousands of crows glistening in the moonlight descended on the lawn in front of her. What were they saying? Nana? No, just cawing. So loud she couldn’t bear it. Sara collapsed on the rough wood floor. The sky filled with crows and ravens…cawing…calling her…Sara…Sara…Nana…and the air from their wings lifted her…lifted her into the black night…floating…flying…with Jason flying beside her. Second Place Nonfiction in the GCWA 2016 Writing Contest. Dan hated his new teeth. Just uppers, not lowers. He still had his own bottom choppers. The plate fit improperly and hurt when he chewed, so he liked to remove it when he ate. Living alone, he often dined out or picked up something to go rather than cook. On this particular hot summer night, coming home late from work, he decided to stop for pizza. The pizza shop was full, so he took his food with him. Enticing smells rose from the seat beside him in the car — mushroom, pepperoni, extra cheese. He could almost taste it. For a while he resisted, but it was a long drive. Opening the box, he grabbed a slice. Of course, the teeth were extracted before the first bite. Cruising down the highway, he continued eating. Not the safest way to operate; worse than texting while driving. Soon the pizza box sat empty. Almost home, he spotted a Dumpster behind the grocery store across the street. He lifted the empty box and tossed it. Perfect shot, right into the trash. Dan pulled a pair of jeans over his pajama bottoms, found a flashlight, and headed for his car. He searched the seats, under the seats, in every crack and crevice. There could be only one answer. He drove back to the grocery store. Did he really want to go Dumpster diving? What were his choices? Forget it and get another set of teeth? But teeth cost big bucks. He didn’t have money to throw away. Child support for five boys, two in college, helped make the decision. Dan looked around to see if anyone was watching. The store had closed and no people roamed the streets. He tried leaning over the side of the container, shining his flashlight to see. He hoisted himself up and dropped into the nightly trash. Luckily, it held mostly boxes and not much food. His pizza box sat on top, wide open and empty, so he proceeded to rummage through the debris. He heard a blip of a siren and a blue light flashed against the wall of the store. A head peeked over the top of the Dumpster, and a light blinded him. Dan climbed out and brushed himself off. “Looking for something I lost,” he tried to explain. Dan recognized Sam, his niece Marcy’s father-in-law. Dan hesitated. He didn’t want to tell him. Embarrassing! Still chuckling, Sam went back to his cruiser and drove off. He leaned to pick them up, but they were imbedded in the asphalt. Apparently, they’d been run over a time or two. He found a screwdriver in his trunk and dug out the teeth, only to discover a crack down the middle. He was tempted to toss them, but changed his mind. Asphalt covered the broken teeth, but stubborn Dan dropped them into a jar and filled it with paint thinner. The next day he examined the dentures and decided the crack could be fixed. He found some crazy glue at work, glued them together, and clamped them in a vise. It worked. They felt better than before they broke, but a faint taste of solvent lingered for a few days. Dan wore those teeth for three more years before getting new ones. Note: This is a true story as told to me by Dan, who is no longer with us, so the story can’t be verified. Any embellishments on the truth are his. I did see the teeth with the crack that had been crazy-glued. No sign of the asphalt, but the teeth looked a little gray. I don’t usually pick up books of short stories to read. I’m not sure why since I enjoy them. Of course, they come in a variety of flavors. I’m reading a book of short stories at the moment, Trouble in Mind by Jeffrey Deaver. Some of them are long enough to be novellas. Some feature characters from his mystery/crime novels and some don’t. They are all good reading and each one has a twist in the plot. The first book of short stories I remember reading and enjoying (many, many years ago) was by O. Henry – always a twist at the end. I’ve read a few other books of short stories recently, mostly books I’m working on, editing and/or formatting for authors to self-publish. Each book is different from the other and all are enjoyable. Seven Days: One Story a Day from the Philippines by Terence Flannery is a combination of truth and fiction from a good storyteller. Some are delightfully funny, others sad. The book is available on Amazon Kindle. Also in the works is a memoir from Marsha Perlman, which in reality is a group of short stories about events in her life. She has led a very interesting life. The book should be available this summer. There are other books of short stories that I’ve reviewed previously on this blog. Check them out Post to Post Links II error: No term found with slug "short-stories". Tom Nelson – My Story and I’m Sticking To It! Tom Nelson writes refreshing true stories about his hometown Fennimore – the people, the places, the adventures. He writes with humor and heart. For anyone who grew up in a small town (or even a small community in a big city), Fennimore feels like home. He paints a delightful picture that takes the reader back in time and brings back memories. When I read these stories, I can feel the energy, whimsy, and upbeat personality of the author. They are full of life. A combination of fiction and real life, humor and pathos. Such a delightful read that I even re-read it.